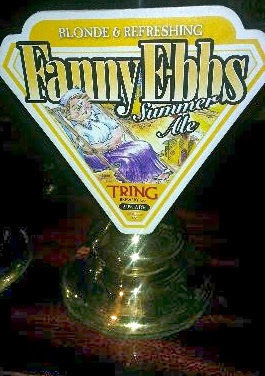 Pumpclip Parade: Tring Brewery - "Fanny Ebbs"
Tring Brewery - "Fanny Ebbs". Submitted by Karen Whickam (@mrsbeerymatt) who comments " I'm getting a bit tired of the 'Can I have a pint of your Fanny?' jokes." Surely it's the ones who ask for tasters who'd be the worst?